On April 25th we had full house in webinar Create faster Enterprise Apps for Windows 8 . It was very overwhelming exciting discussion with attendees. In webinar we focused on DataGrid and Chart. WinRT is common for both Windows 8 & Windows 8 Phone? No WinRT is not common for both Windows 8 and Windows Phone 8. WinRT is part of Windows 8 Operating System. Is Silverlight supported on Windows 8 IE browsers? 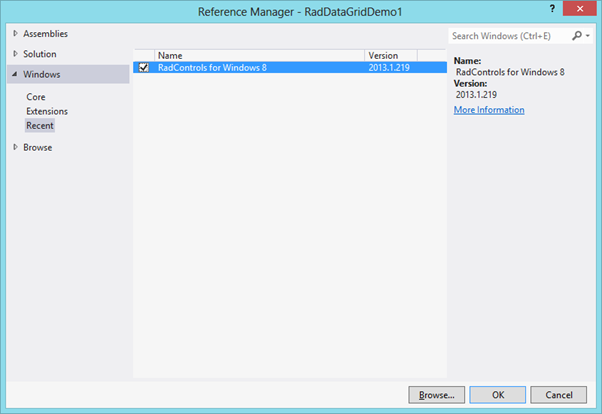 Can we use RadControls for Windows 8 in MVVM architecture? Yes you can use them in App creating using MVVM architecture. Can we sort the column in RadDataGrid control? In case we purchase rad controls today for $599, after august will we be eligible to get addition controls.if yes, do we need to pay more? Does grid support combobox, checkbox at cell level? Yes you can add them. You can add any controls in TemplateColumns. Is it possible to retrieve data from Windows Azure and result will display in Chart Rad Controls? Can we use ado.net or asp.net web api instead of wcf for linking to database? Congratulations to the winners and we will be getting in touch with you soon. Hope you liked this webinar and we hope to see you back in our future webinars. We are excited to share that Telerik India will be present at Great Indian Developer Conference. We will be around for all three days. We request you to visit our booth. 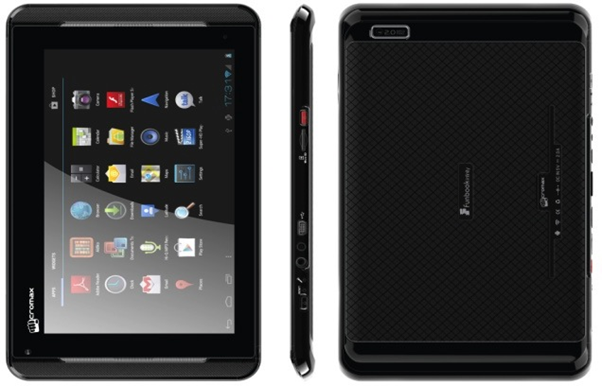 Along with technical presentations and discussions, we will give away 1 Micromax tablet in raffle daily. We are helping GIDS by creating apps for the event as well. We have created apps for iPhone and Android devices. We are excited to see you at GIDS. Q: on which platform it should work? A: It will work on any platform. It is web application running in browser. Some screens are not supported on mobile devices as of now. Q: The properties – are they customizable…can we add / modify / or delete? A: Certain properties for the requirements are customizable for example you can change what appears in the drop downs for Maturity, Certainty, etc. You cannot change the names of the labels. This is done by modifying the project template. Q: can we track multiple projects at the same time? Q: can PO be the BA ? If BA can accomplish the above two, he/ she can act as PO too. Generally, PO is someone from the client side. Q: is it mandatory to use TFS with the Team pulse? A: TeamPulse can be used as a stand alone too. It is not necessary to use TFS for project management. If you have already invested in TFS – you can integrate with it. Q: so where i have to use agile? A: Where to use Agile – its up to you and your team. Agile is developmen methodology that industry is leaning to. Short sprints i.e. ideally a 15 days to 30 day sprints, where you work on a requirement and make sure you finish it to a done state. so its upto you if you want to go the Agile way or Waterfall model. Q: even for new product there is a backlog..? A: Can you please elaborate on this ? Q: is the sprint scope defined by Scrum master or PO? A: The sprint scope should be decided by the team based on their capability. It is important to know your team velocity so that you can deliver what you can promise. Buy in from PO is important too. Scrum Master is there to facilitate things. Q: is some kind of automated integration available in teampulse for other telerik products? A: TeamPulse integrates beautifully with Telerik Test Studio for bug management. While TeamPulse is built using Telerik controls, the cross project view is built using Kendo UI. Q: why the product backlog decided in the begining of the project?? A: In Agile Methodology – you identify the requirements or user stories upfront and create a log of that. That simply put becomes product backlog and once you achieve all the backlogs – you will have built your product. so thats why you define your requirements upfront. Thats one of the core agaile principles. A. We offer burn down reports, velocity reports for individual projects and across projects. We also offer timesheet views and productivity views for individual team members. Q: Do we have any video sessions for the Team Pulse? 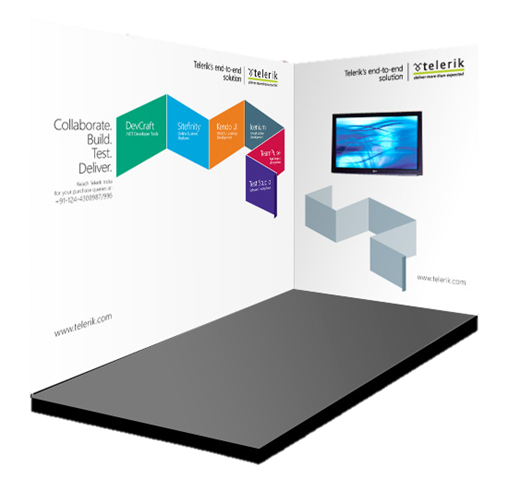 A: We have what we call – Telerik TV – http://tv.telerik.com/products/teampulse. Here you can find short focused videos done by evangelists. This is a free public site. no registration required. Q: Is there any option to track the retrospective out comes? so the team and scrum master can ensure that the retrospective points are addressed. Q: Could Scrum be implemented in production support project? A. While Scrum can be used in production support projects, Kanban is frequently used for this. TeamPulse can be used for managing Kanban projects as well. Q: how we manage if task cannot be completed in a given sprint? A: If the task hasn’t been started, the task should be assigned to the next iteration. Q: can we do a migration from TFS 2012 to teampulse? Q: Do you have some sort of mechanism to mark the user story as broken when a bug is associated to an user story? A. Yes, it is displayed on the board that there is a bug or blocking bug. If blocking it will identified by red colored icon. Q: if that is a new project….even then we have the backlog? A: Yes. normally you will start with a product backlog. Then pull items to sprint backlog. Q: how the roles will be assigned and mapped to each project ? A. TeamPulse offers built in groups and the ability create new custom group. Such custom groups can be assigned the desired permissions in a project. Q: We know in an agile environment, we need to respond to changes. What kind of change management process to be implemented for cost control? Q: looks like tfs can do pretty much all of these things. What advantages does this have over TFS? Q: Does it have some sort of notification to the task owner if any associated issues/Impediment is resolved by the scrum master? or the scrum master will get the update? A. He can through our notification system but he will need to configure what types of notifications to receive. There are some limitations. Q: agile is a framework? A: Yes, it is a framework as it makes recommendations. Scrum and Kanban are specific implementations of this framework. Q: How about the interface to manage the issue management – if we are using some other tool on the same? A: At the moment we support only integration with TFS. Q: Can we use Teampulse for teams working across geographies? A: Yes. TeamPulse is an ideal solution for such teams. This is a web application and so anybody can log in from anywhere. However, the teams needs to understand the Scrum process well. Q: What database the TeamPuse connects with? Q: In the test management, there was one topic called traceability. What is it? A: Traceability lets you trace different things like for a bug – in which sprint was it logged, what was the check in against that bug, which backlog item was that .. etc. Q: When you create a task i could see Given, When and Then statements in it. Does it have any support to BDD? A. No, the only BDD like item that provide is our acceptance criteria for stories and bugs but not on the task level. Q: What all support does it have for the process compliance? do we have any reports specific for the quality delivery group? Q: Can we do a migration of data from JIRA/TFS 2012 to teampulse? A: At the moment we support only TFS. Q: How can priority be assigned to a task? A. You set priorities by dragging and dropping the order they should be completed in. So, a task on the top of the list gets more priority than the one of the bottom. While creating your Sprint backlog, it is important to start looking from the top. Q: Is there any metric to measure regression caused in a sprint? Q: how do we maintain the hierarchy of user roles? Do we have any such hierarchy? Q: Can we configure the list of work items that need to be completed as part of a user story? This is just for tracking its completion? A. Yes through creating Tasks in a user story. Q: Does TeamPulse integrate with JIRA? A: At the moment no. We have integration with TFS only. Q: do we have a desktop plugin version of this tool ? some environments may not have access outside intranet? A. It’s a web application that is self-hosted on your server. So, the access can be restricted to the sub-set of people you desire. Q: Can we handle restricted story points? Visible only to specific people? A. No. All stories are visible to all team members. One of the key tenants of Agile is transparency throughout the team. Q: once an epic is split into sprintable units, what do you do with the original epic? Do you keep it with the stories until all are done? Do you retire them into some kind of epic archive? Do you just delete them? Q: Can I check resource assignments using team pulse…like resource utilization etc? A: Yes. we give you resource utilization metrics built on time sheets. Q: How would we arrive at the velocity of the team? Q: the project status looks cool. Burn down chart is a really nice addon over TFS. A: Thank you. Glad you like it. Q: Is project manager and team leads both can see how many release are planned for particular month? Q: Does Teampulse comes with Tereik Test studio or similar? Q: Is Team pulse compatible with Jira/ Clearcase/ Clearquest? A: TeamPulse currently integrates with TFS. Q: Where does the tool store all its metadata? Does it work on client-server relationship? Q: Will developer daily need to update the story board? Q: Is teampulse accessible via internet? Currently there is no SaaS offering available. Q: can we assign the tasks to individuals in Teampulse. Q: Didnt see a log where we can have the daily meeting minutes entered so that it can be reviewed and the end of the sprint? Q: Can we handle multiple project? and multple team? A: Yes. we support cross project views. meaning – as a manager you can set up your dashboards to see health of more than 1 project. Q: I believe the key behind agile is having all the learning experience documented for future reference and better sprint planning do we have any such features here? A. Issues can be have a resolutions added to them and associated with a time line such as iteration or simply tag for future retrieval. Q: How to login access to tempulse? A: Currently, TeamPulse is a self hosted solution. It can be integrated with your Active Directory environment or can have separate login credentials. Q: Project Management Reports is export them as PDF, Excel ? Q: is it multilingual? can it be used in other language like spanish ? A. No. Although comments, user stories etc can be put in any language. You can only localize our feedback portal. Q: what are the process template available in Teampluse? A. Scrum for Team System v 2 and 3, MS Agile, CMMI and Scrum and our own TeamPulse template You also have the ability to change any template. Q: Does it support Kanban dashboard? A: yes. WIP is supported. Q: is the api available for teampulse? Q: As a Customer can a person log a bug or enhancement by Email in TeamPulse? A: Not by default. However, integration points are available. The winners have been contacted directly and the prize will be shipped to them shortly. Feel free to post your query in the comments section below. Recently I was in a Windows Azure event for local user group. Attendees were very excited about Windows Azure Mobile Services. When I discussed with them how more immersive and user friendly it could be working with data from Windows Azure Mobile Service Table in Telerik RadDataGrid, they got more excited. In this post we will go very basic and learn basic required steps to fetch data from Mobile Service Data Table in RadDataGrid. 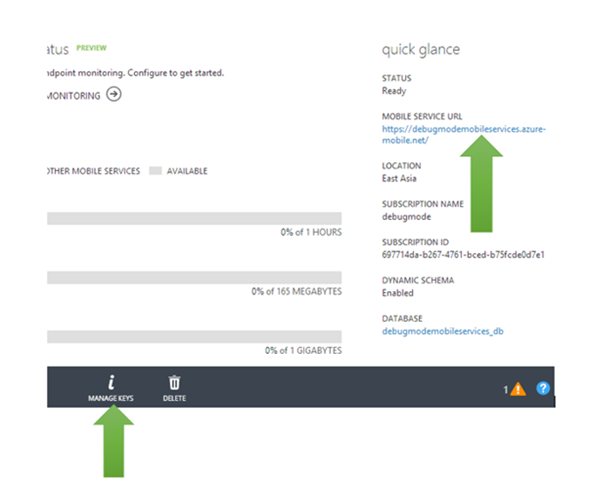 You can view all Windows Azure Mobile Services and tables by login to Windows Azure Management Portal. We are going to display data from techbloggers table. 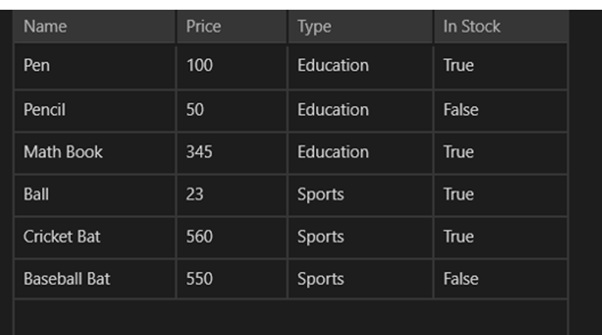 I have created this table in Windows Azure Mobile Service as shown below. There are three columns in table. We will display content from techbloggers Mobile Service table in RadDataGrid. We need App URL and key. You need key and application URL to work with Mobile Services from Windows Store application. You will find key and application URL at the portal. Now go ahead and create a Windows Store App by choosing Blank App project template from Windows Store project tab. After project being created add Rad Controls for Windows 8 reference and Windows Azure Mobile Services Managed Client reference in the project. To add reference right click on Reference in project and select Add Reference. Next add following namespaces on MainPage.xaml.cs to work with Mobile Services client. 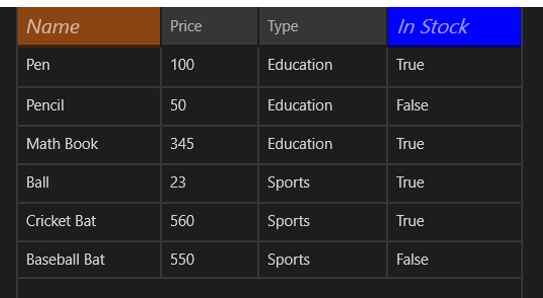 Next you need to create entity class representing table from the Windows Azure Mobile Service. Let us create entity class as following. We are creating entity class TechBloggers. After creating entity class go ahead and add following global variables. Once global variable is defined in the constructor of page you need to create instance of MobileServiceClient and MobileServiceTable. Let us go ahead and create that in constructor of the page. Next you need to bind RadDataGrid to List of Bloggers. List of Bloggers will be fetched from Mobile Service data table. You can do this as following. Next go ahead and run application. You will get records from Mobile Service table bind to RadDataGrid. 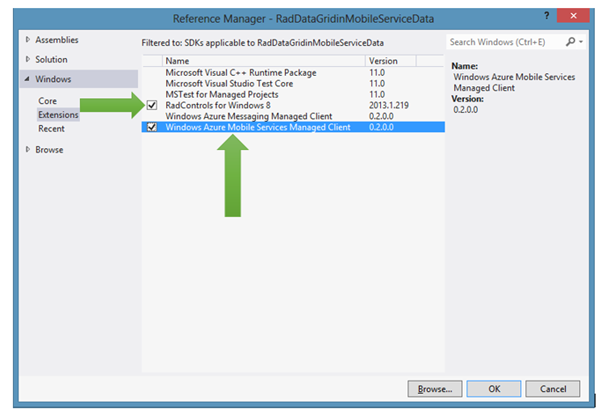 These are basic steps to fetch data from Windows Azure Mobile Services Table Data and display in RadDataGrid. In further posts we will get into further details of working with these two together. I hope you find this post useful. Thanks for reading. I am very happy and excited to share with you that Telerik Products have been nominated in different categories in GIDS 2013 . We have been nominated in 7 different categories. Telerik TeamPulse is nominated under Collaboration Solution category. To vote for this select this option in Question number 2. Telerik Sitefinity CMS is registered under Content Management category. To vote for this select this option in Question number 3. Telerik TeamPulse is nominated under Change and Configuration Management category. To vote for this select this option in Question number 5. Telerik TestStudio is nominated under Testing category. To vote for this select this option in Question number 6. Telerik KendoUI is nominated under Web Development category. To vote for this select this option in Question number 8. Telerik Icenium is nominated under Mobile Development category. To vote for this select this option in Question number 9. Telerik Devcraft is nominated under Framework category. To vote for this select this option in Question number 10. Your love and support will help us to build better products. Take few minutes out and Navigate here to vote. If you are a Windows Store App developer and want to quickly create Enterprise App then this webinar is for you. You will learn to create Enterprise App harnessing goodness of DataGrid in this webinar. Setting up environment to work with RadControls for Windows 8. Grouping and Filtering in RadDataGrid. In this webinar we will focus on Data Grid along with other controls. 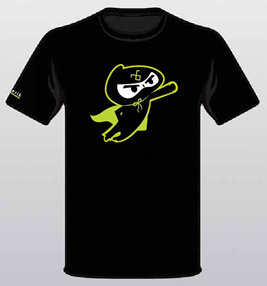 During webinar we will be selecting two active participants from the webinar and sending them the much in demand Telerik Ninja T-Shirt. You will be coming, right? Before you start with this post I recommend you to read following blog posts to get it started with RadDataGrid. In this post we will take a look on working with Images as column value in RadDataGrid. 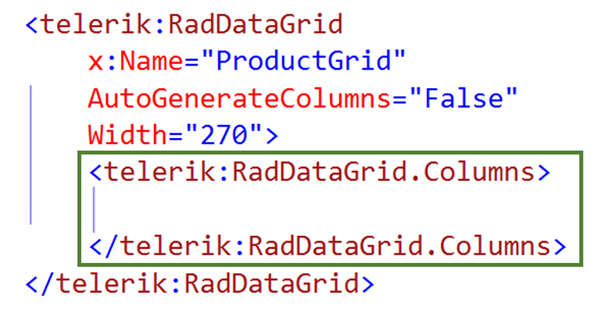 As we discussed in this post that there are two types of columns in RadDataGrid. To work with images we need to work with TemplateColumns. TemplateColumn uses DataTemplate to define content of column. To start with let us create business class Product. We will display collection of Products in RadDataGrid. Product class is defined as following. Along with other properties there is a property of Product Image. ProductImage property will hold URL of Image to be displayed for each Products. Next let us create collection of Products locally. GetProducts function will return list of Products. We will bind this function as ItemSource of RadDataGrid. As of now we have data source in place. Next we need to create RadDataGrid. After creating RadDataGrid we will create DataGridTemplateColumn with DataTemplate. To create RadDataGrid with image as one of the column value we need to follow following steps inside RadDataGrid. Now go ahead and run application. You will find Product Images as one of the column value. In this way you can work with Images as column value in RadDataGrid. I hope you find this post useful. Thanks for reading. This is the eight post in the series on Kendo UI wrappers for ASP.NET MVC. 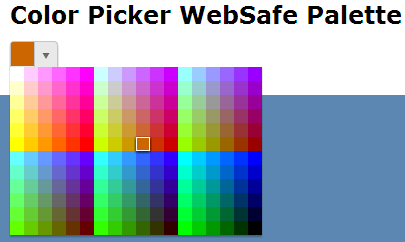 We will look at one more wrapper in this post namely Color Picker. This post is part of a getting started with Kendo UI wrappers for ASP.NET MVC and you can find the index post here. The ColorPicker is a drop-down widget for selecting colors. It’s designed to replace a HTML5 <input type="color"> field, which is not yet widely supported in browsers. ColorPicker widget provides a user-friendly interface for picking colors. ColorPicker wrapper is just a kendo helper for ASP.NET MVC. In order to use the ColorPicker widget on any page, we will use the ColorPicker wrapper or helper available as part of the kendo wrappers. Following is the code to create a color picker on any page. 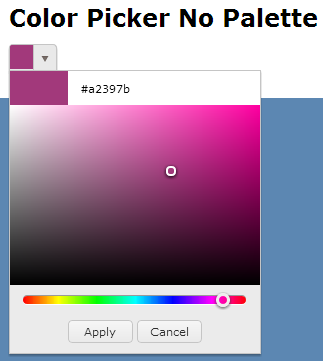 Note that Name() is a mandatory setting for the color picker. Without setting the name we will get an exception which will tell that name is not set. In the above code – we just created the color picker using the server side helpers. On client side, after document has loaded, we grab the control, use the value() method to set a new value. And then use the same method to read back the selected value. 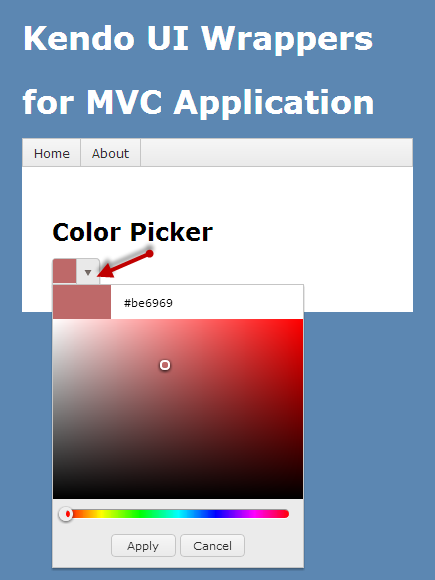 Through this post we looked at yet another kendo wrapper for MVC namely Color Picker. Using color picker is as easy as settings some configuration methods and the rest is done by the helper for you. Hope this excites you to test out Kendo UI in your projects. 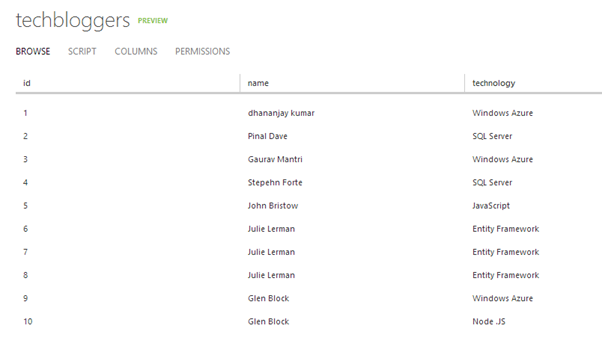 To start with first you need to add following references on XAML. After this you need to manually create columns. Create RadDataGrid.Columns inside RadDataGrid. PropertyName : Set this as property name of business object you want to display in this column. In this way you can work with column header style. I hope you find this post useful. Thanks for reading. In last blog post we learnt to work with RadDataGrid in three simple steps. In this post let us have a look on how we could work with Columns in RadDataGrid. 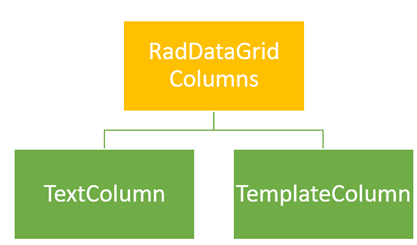 Before we move ahead and understand how to work with columns width and columns header, let us have some understanding on columns in RadDataGrid. There are two kinds of columns in RadDataGrid. TextColumn renders each cell value as System.String object whereas TemplateColumn renders as DataTemplate. In this post we will focus our discussion on TextColumn. It inherits DataGridColumn. After this you need to manually create columns. In column creation you need to set width of the column. Create RadDataGrid.Columns inside RadDataGrid. 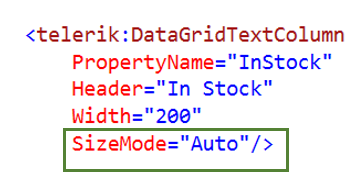 Width property takes effect only when SizeMode is set to Fixed. If SizeMode is set to Auto then column takes only width which is required. It overrides value of width. If SizeMode is set to Strech then column will override width value and stretch to all available space. In this way you can work with column width. I hope you find this post useful. Thanks for reading. Recently I was talking to Windows Store App Developers. When I show them demo of RadDataGrid , all they got very excited. One of the manager asked me to show working with RadDataGrid in simplest steps. In this post we will take a look on working with RadDataGrid in three simple steps. Go ahead launch Visual Studio and create a new Windows Store Application. Select Blank App project template to create application. 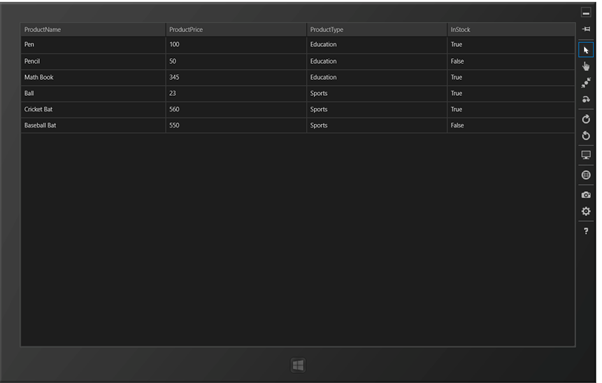 After project being created add Rad Controls for Windows 8 reference in the project. To add reference right click on Reference in project and select Add Reference. We will display Products in RadDataGrid. In real time scenario List of Products will be fetched from Services. For purpose of this post let us create List of Products as collection locally. In these 3 simple steps you can start working with RadDataGrid in XAML based Windows Store Application. In further posts we will get into deeper concepts of RadDataGrid. I hope you find this post useful. Thanks for reading. Apr – May 2013 will see a series of webinar from Telerik India pertaining to Data Visualization, Team Pulse, Windows 8, SiteFinity, Windows Phone 8 and Kendo UI. 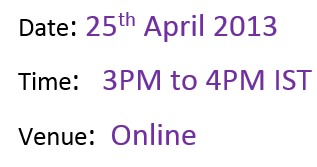 If you are interested in any of these webinars do take a look at the following post: https://telerikhelper.net/2013/03/19/ninja-enough-telerik-india-webcasts-april-may-2013/. Why do we need Data Visualization ? How do we do Data Visualization ? What does HTML5 technology define for Data Visualization ? Easy HTML5 Data Visualization with Kendo UI DataViz from Telerik Helper on Vimeo. There are couple of free jquery plug-in available on the net. which do all these charts. how Kendo UI different from them? Being a .Net developer why I should use HTML5 and not Silverlight for all this. same can be achieved with Silverlight as well? The decision to use Silverlight or HTML5 will depend on the nature of the project. Silverlight is still a plugin based technology where as HTML5 is trying to standardize the web world with a common structure to be supported by all browsers. For running Silverlight applications , user has to download the runtime first. Is it the same for Kendo UI code? Why we need to choose separate chart product – when asp.net charting can give the charting option? The charting option provided by ASP.NET as far as I know if not HTML5 based. Meaning the output of the chart/graph through ASP.NET charting is still Image based and does not use the HTML5 recommended SVG for output. Where as Kendo UI is a HTML5 compliant and outputs the charts/graphs as SVG on modern browsers and as VML on older browsers. Can we add Kendo UI references into the PHP project? Can we change the styles according to us? Can we use Kendo on Windows 8 metro & mobile apps ? Kendo UI consists of 3 packages – Web, DataViz and Mobile. The Web can be used for Web Applications. Mobile controls can be used to develop Cross Platform Hybrid Mobile Apps. So Kendo UI Mobile Controls support Windows Phone. As of now we do not have support for Windows 8.
can we use it for 3D, is there any support for that? We do not support 3D charting at the moment. Will this work on mobile browsers ? Since DataViz output SVG as the format for the chart/gauges, it can run on both desktop browsers and mobile browsers. Does the charts support Drill Down option? Drill-down functionality is not supported out of the box yet. However the chart exposes a seriesClick event which can be used instead. You can find a live demo here. 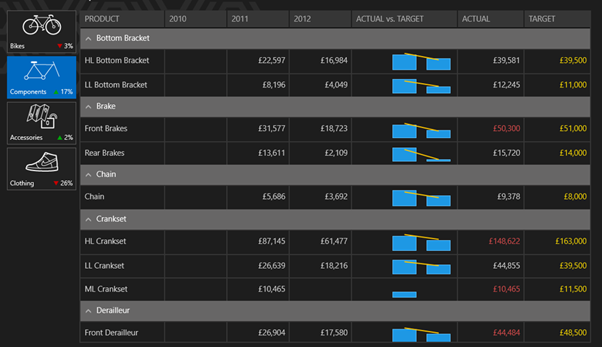 In the demo shown, was usage of valueAxis , categoryAxis, tooltip…. are these syntax to use kendo ui or some sort of data…?? These are the configuration settings you do on the Kendo UI DataViz objects and at runtime the chart is generated based on these settings. Can i use Kendo UI in my .net application instead of SSRS charts? Absolutely. You just need to make sure you provide an endpoint which can return JSON payload and the Kendo UI DataViz widgets can consume data and plot it. How do we know Kendo Chart options ? as you are passing some options to it. is there any full fledged docs ? The Kendo UI Documentation can be found at http://docs.kendoui.com. We have the API reference, Getting Started, Tutorials at the documentation site. Does this come with Samples? Yes. whether you download the trial or licensed version of Kendo UI – we ship the demo source code with it. can we populate the data from database and bind this data to kendo charts? Kendo UI is server side agnostic and does not care about what is the technology used for server side. Having said that the way Kendo UI works is – it can understand JSON or XML. So as long as data is passed as JSON/XML we don’t care about anything else. So you need to make sure that you create endpoint i.e. services which can return data in JSON or XML format. Kendo Widgets will be able to read data from those services out of the box. Congratulations to the winners and we will be getting in touch with you soon. Rest of you don’t loose heart. We have 5 more webinars in April and May and in each webinar we will be giving out 2 shirts each. Hope you liked this webinar and we hope to see you back in our future webinars. Test oracle determine that whether a test executed as expected or not. Essentially you can say test oracle is a mechanism to determine whether program, software or application got executed as expected for a particular Test Case or not? A test oracle may be either manual or automated. Test Oracle is very specific to a business scenario and probably tool may not able to automate this. Test Oracle can be written as Coded Step. 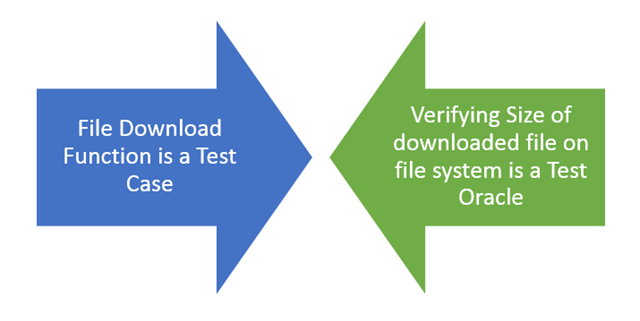 We can summarize Test Oracle as parameter which verify that whether application passed a test for a particular test case or not. While automating a test understating of DOM is very essential. Any tool read DOM to automate test. In this post we will try to understand what DOM is in simplest words. Tool sees whole page you are doing automation testing as DOM and searches, finds elements in DOM. As of W3C definition: DOM stands for Document Object Model and it is a programming interface to manipulate a well formed HTML or a valid XML document. 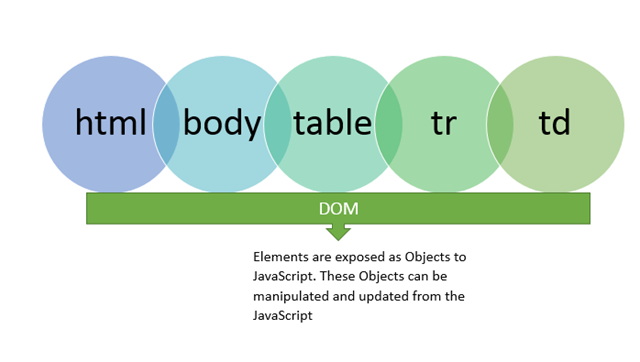 Here we will discuss DOM in context of HTML. 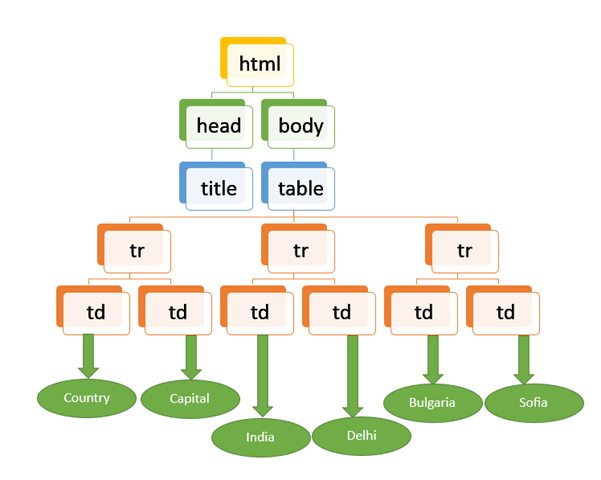 DOM see a HTML document as tree. All elements can be seen as nodes of the tree. Attributes and value of elements can be seen as leaf of the tree. 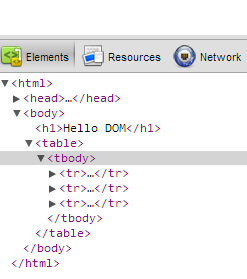 Browsers generates DOM when it parses the HTML. For example, when you browse above HTML in browser it will parse the HTML and create DOM. You can view created DOM by pressing F12 in any mostly used browser. I hope now you have descent understanding of DOM. You need understanding of DOM to automate test. I hope you find this post useful. Thanks for reading.